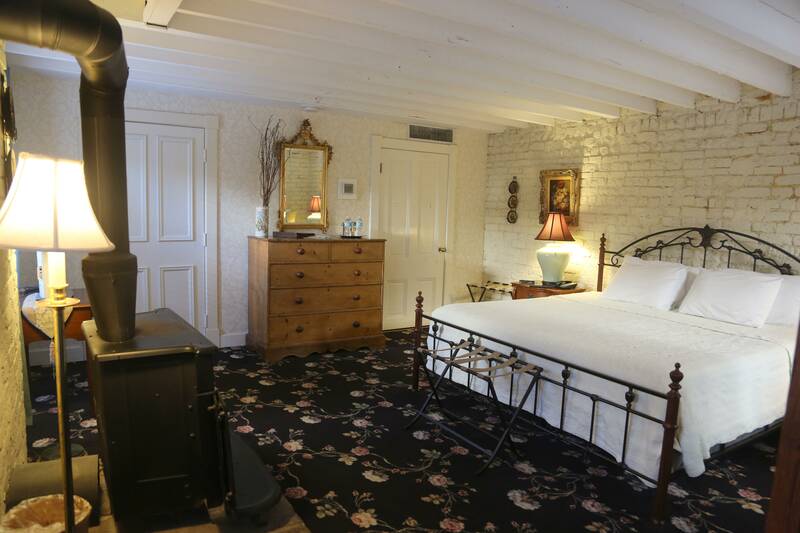 One of the 3 garden level rooms in this Savannah B&B with hallway access to our lush, hidden courtyard. The room features a private bath, king size British four-poster bed, with exposed brick walls, beamed ceiling, a working fireplace, 32 inch flat screen HD television and armoire. A cozy and intimate room, ever so cool in the long Savannah summer, with a working fireplace for the nippy air in winter. This is a cozy, comfortable room. Click the image to enlarge. This garden level Savannah bed and breakfast room features an English period King Bed with beamed ceilings, 42 inch flat screen HD television, private bath, working fireplace, Chippendale table and chairs, and a private entrance to its own garden patio area to enjoy morning coffee and afternoon wine. You can even have your breakfast served on the patio. Wonderfully cool, intimate and private. Click the image to enlarge. 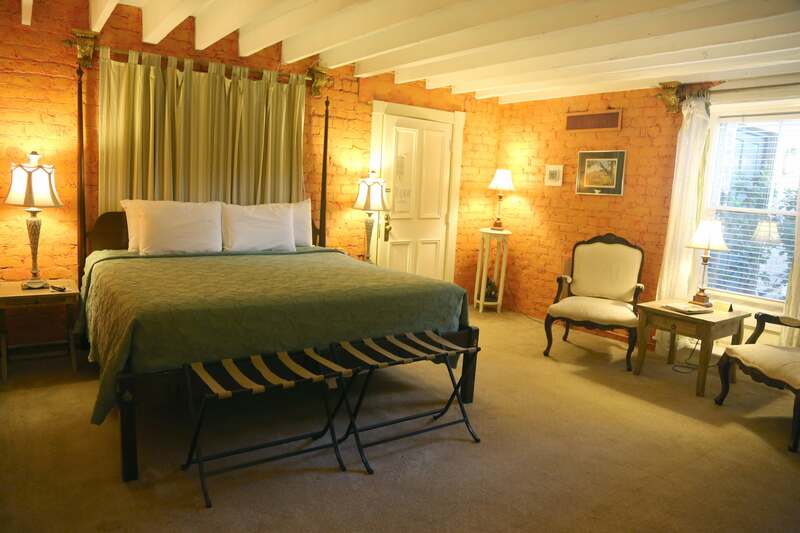 This French country garden themed room offers the hint of Provance yet set in the walled courtyard of old Savannah. 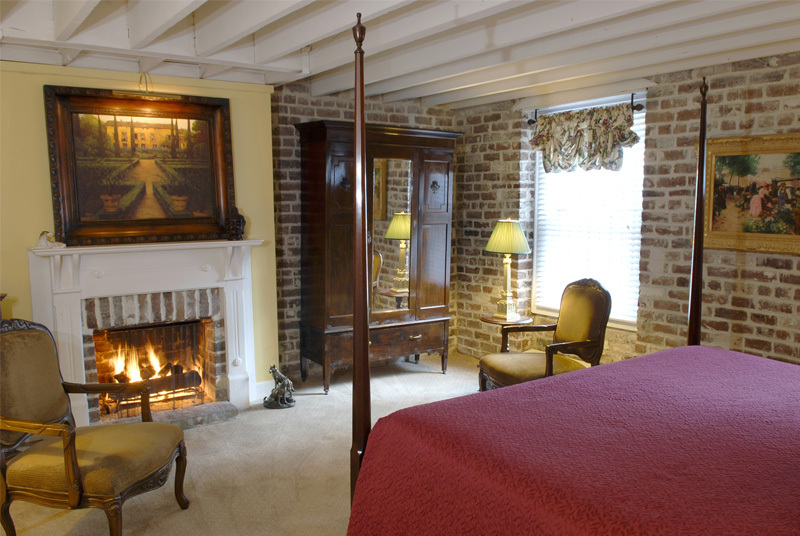 Two walls of French door windows, 32 inch flat screen HD television, a King bed, private bath, and a working pot-belly fireplace make it hard to believe you are in the heart of the city in a Savannah bed and breakfast. The room features a private entrance to our lush courtyard garden. A perfect place for a glass of wine or a cup of coffee. It is also wonderful to have your breakfast outside in our Savannah B&B gardens. Click the image to enlarge.